Andrea O. Hollingsworth, RN, PhD, is the Dean Emerita of the Gwynedd Mercy University Francis M. Maguire School of Nursing and Health Professions. 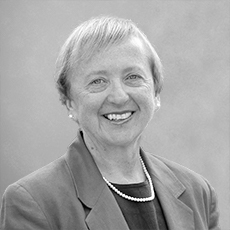 In 2001, she began her tenure at Gwynedd Mercy University with significant leadership experience from other educational institutions. She retired as Dean in August 2018. She currently serves as a Fellow in the M. Louise Fitzpatrick College of Nursing of Villanova University. She is widely published in the area of maternal-newborn and women’s health. Specific journals include: Journal of Nursing Scholarship, Public Health Nursing, Clinical Nurse Specialist, Home Health Nursing and the Journal of Perinatal Education to name a few. In addition, she has received funding for research studies and has significant grant management experience. Dr. Hollingsworth served as the President of the Pennsylvania Higher Education Nursing Schools Association from 2006-2008. In 2010, she joined the Board of Directors at Nazareth Hospital located in Philadelphia and she now serves as Chair of this Board. In the April 2009, Dr. Hollingsworth was presented with the Villanova University College of Nursing Distinguished Alumni Award. She was recognized by the American Association of Colleges of Nursing as Advocate of the Year in March 2018 for her work in government affairs for the organization and nursing education.